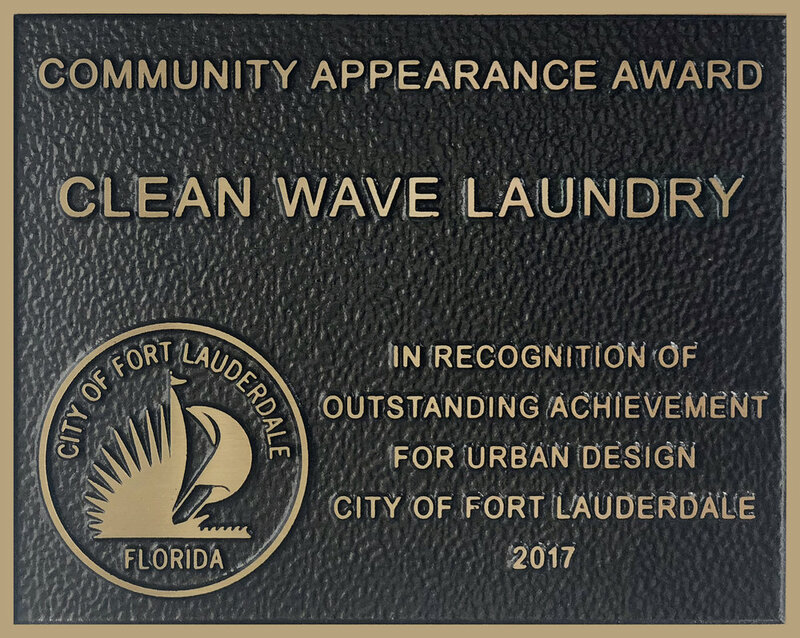 BROWARD COUNTY, FL – Clean Wave Laundry was honored by receiving the Community Appearance Award from the City of Fort Lauderdale in recognition of outstanding achievement for urban design. The Clean Wave Team reimagined the typical laundromat style and executed their own unique, fresh take on it in South Florida, particularly in an urban, low-income area. Some of the unique challenges the team faced include restructuring the original concrete structure to include impact windows and doors, drastic external structural changes including a parapet wall to line the roof of Clean Wave Laundry to increase ceiling height, and hand-laying 30,000 bricks to the exterior of the structure. The idea behind adding windows around the facility is to allow as much natural light as possible to enter, creating a well-lit space for customers while also complimenting the facility’s eco-friendly vibes. The 30,000 hand-laid added a crafted look not common to the South Florida area. The entire exterior part of the building is also coated in anti-graffiti paint in order to preserve the aesthetics of the structure. Clean Wave’s design and construction teams created a unique and welcoming space for residents in an area where new construction projects are far and few in between. Residents of this area normally have to drive several miles from their homes to experience a comfortable and safe public place. The interior details inside Clean Wave reflect craftsmanship and eye-catching design. The team was awarded a plaque at the Award Ceremony on May 11, 2017.